Living in Central Florida has its perks, but this time of year brings one exceptionally large problem as well. Heat illness. We are now beginning the hottest part of the year and temperatures have already, consistently, been over 100° F. In an arid climate, this would not be quite as bad because our bodies have a natural cooling system called perspiration. However, in the high humidity of Florida, perspiration does not evaporate as easily and therefore does not cool us off quite so well. This means we must take extra care of ourselves when we are out in the elements. Heat illness is basically the body’s inability to cool itself down. This seems simple, but can actually be quite devastating and possibly even fatal. Our bodies run at a fairly high temperature thanks to our metabolism, which is the process that converts nutrients into energy inside our bodies. With the conversion of energy, a lot of heat is produced. Heat is also produced by our muscles when we use that energy during exercise. When our bodies generate all that heat, we begin to sweat. If the sweat is not enough to cool down our bodies, then perspiration stops and we begin to suffer from different degrees of heat stress which cause illness. Heat cramps are the first stage of heat illness. They usually occur a few hours after exposure to hot conditions. Symptoms include involuntary muscle spasms (cramps) in the arms, legs, or abdomen. These are usually accompanied by profuse sweating, normal pulse, normal breathing, and possibly dizziness. Treatment: Sit in a cool place! Massage muscles, with ice and/or ice water. Stretch. Drink plenty of fluids, diluted electrolyte drinks or plain water are preferred. 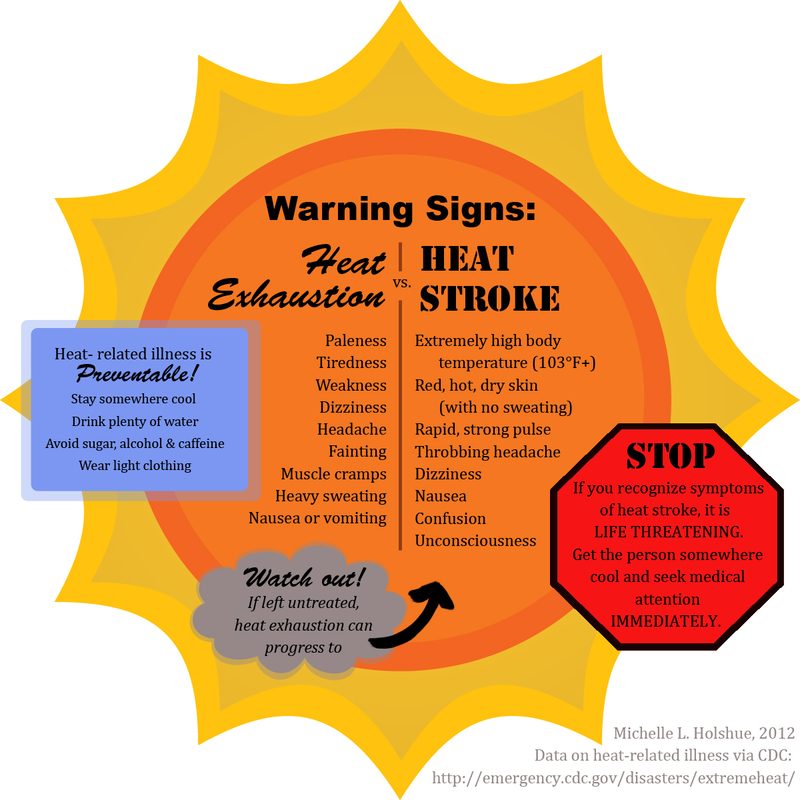 Heat exhaustion is the second stage of heat illness. This is what happens when our bodies no longer can cool itself and, as such, usually occurs after several hours of intense sweating without replacing the body’s fluids and electrolytes. When this happens, the skin becomes cool and clammy. Other symptoms include dizziness, disorientation, rapid and shallow breathing, and a weak pulse. Treatment: Remove wet clothing and/or equipment. Use external means to cool the body down (ice water on the skin, ice bath, or cold shower). Replace fluids by drinking if possible, but IV fluid replacement may be necessary at this stage. This is the stage where seeing a physician may become necessary. Heat stroke is the third stage of heat illness, and the most dangerous one. This stage is the one where our bodies no longer produce sweat because we have lost too much water and salt. This is also a life-threatening stage so 911 should be called. Symptoms include high body temperatures without perspiration, vomiting, nausea, increased irritability (usually followed by apathy), disorientation, and a strong and rapid pulse. During this stage, the blood pressure may drop fast enough to cause convulsions and possibly even a coma. Treatment: Call 911! Cool rapidly with ice or an ice bath. The emergency crew will also treat for shock and transfer to a trauma unit. -Though I started this off with heat cramps as the first stage of heat illness, don’t forget dehydration plays a big part as well. If you are thirsty, you are already dehydrated. This is the biggest part of prevention you can do. Hydration isn’t just about drinking enough water, it’s about replacing the water and the electrolytes you lose through perspiration. If you keep a weight chart (weigh yourself before and after exercising) remember, you need to replace 8oz of water for every pound of weight lost. -Allow your body to acclimate to the warmer climate. Don’t immediately rush into physical activity when you emerge from the A/C in your home or car, allow a few minutes to get used to the heat and you’ll be better prepared for it. -Wear loose, comfortable clothing. Some synthetic materials are great for wicking the sweat from your skin, but natural materials allow for better air flow. Avoid polyester if at all possible as it does not absorb sweat and it does not breathe at all. -Plan your heaviest activities for the coolest parts of the day. -Listen to your body. When you feel overheated, rest in a cool place and drink plenty of fluids. Each of the stages of heat illness do include various degrees, and heat stroke can easily be mistaken for heat exhaustion. Also, these stages build on each other, heat stroke can include all the symptoms from the previous two stages as well as its own set of symptoms. 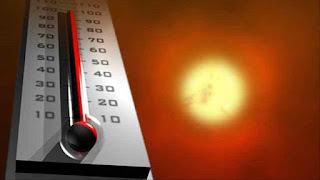 Heat illness is very preventable, just be aware of your body and your surroundings. Hydration is key and listening to your body is a must.